This afternoon I had the great and ever so amazing Haziq Ghafar to help me with today's shoot. I have been experimenting looks this 2015. I even had my hair done short, which I have been too afraid to do for the past few years. Surprisingly I love the change and I would recommend everyone to try out different things, especially different styles! Ever since I caught the Bigbang fever, I fell in love with street looks. Korea especially is big in fashion. Two of my favourite online stores include Kstyleme.com and Stylenanda. The Korean style is modern, somewhat modest and chic. In today's post, which I call "Street Chic", I will show you my street style inspired look. 'Street Chic' // Photo by Haziq Ghafar. What I love about street wear in Korea includes their obsession with oversized garments. 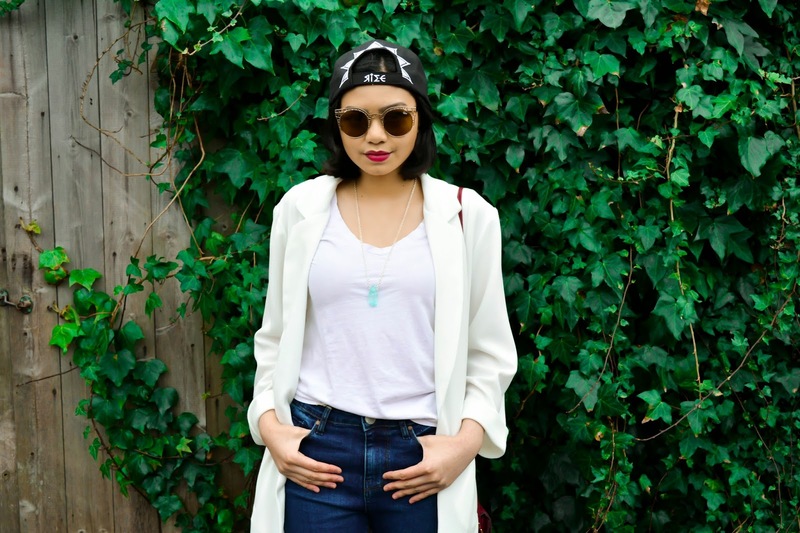 Wearing something oversized can give off both a feminine and edgy vibe. 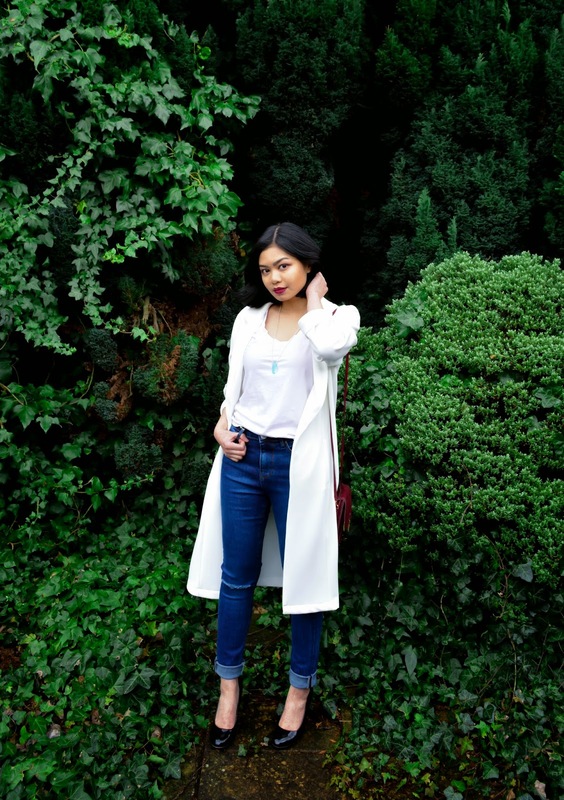 To channel that Korean street vibe, today I put on a white duster coat from Primark and paired it with a V-neck tee from ASOS and the classic blue skinny jeans from Miss Selfridge. 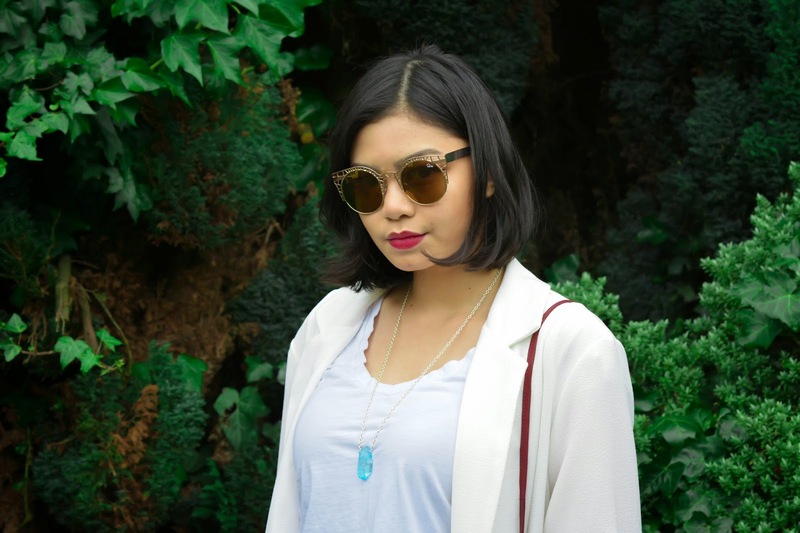 As for accessories, I had my Quay Fleur Sunnies on and this beautiful Luminous Blue Necklace handmade by the young Bruneian jewellery designer from Heartbead. If you are a lover of minimalistic and edgy jewellery, you must log into your Instagram and follow @heartbead for beautiful and affordable hand made accessories! If you don't have an Instagram, no worries! Heartbead is now available on their website http://www.shopheartbead.com! Heartbead's designer is a talented young lady, who is inspiring and a great fashion enthusiast. Her jewellery line is updated and always evolving. You will not be disappointed! 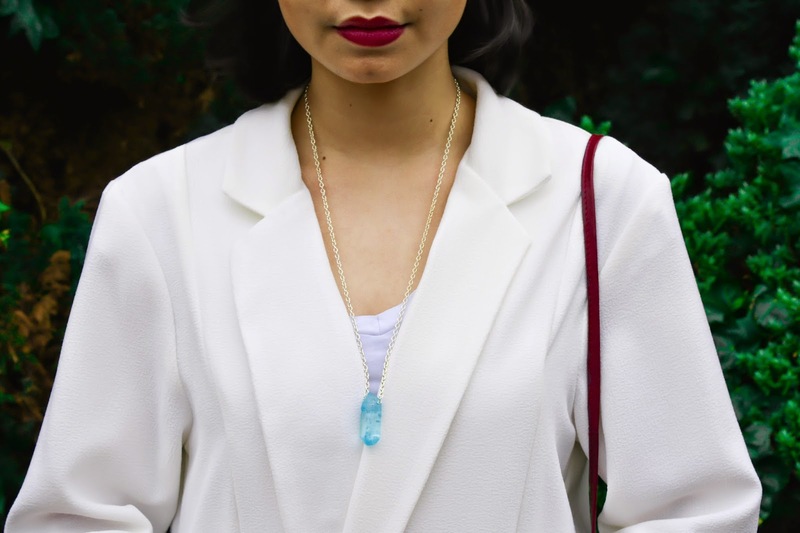 'Luminous Blue Necklace' by Heartbead // Photo by Haziq Ghafar. To achieve the chic for my street look, I wore these black heels from ASOS. Black heels is a definite must in a woman's wardrobe. It can be paired with everything you can possibly think of! It's amazingly versatile and can add class to any look. If you're not a fan of heels and you just crave for that bit of lift, I would recommend platforms like these pair of Vagabonds. Something sleek and much more comfortable! For those of you who love to add that bit of edge to every outfit, I'm sure you would definitely agree that a snapback is a must when you're hitting the streets! This black beauty is a gift from my long time bestie, Fatin D.O. It is a limited edition Taeyang RISE snapback! (I am obsessed with Taeyang's RISE album and I can't wait for Bigbang's comeback this April!). As for a bag, I went for my burgundy leather vintage look cross body bag from ASOS. The burgundy adds a great pop of colour and it also matches my lipstick! That's it for my first attempt of going street style! I hope you like this look and I hope it at least inspires you to also experiment on different looks! You'll never know what you love, until you try! I would like to give a shout out to my favourite photographer, Haziq Ghafar. This boy has many talents, including lifestyle blogging and also much much more! Take interest in this amazing person and take a look at his helpful and informative lifestyle blog The Anecdote of Haziq Ghafar. If you would prefer to have him on your twitter timeline, you can also follow him at @haziqghafar or follow his photos on his instagram @haziqghafar! Thank you for reading fellow Wearriors! Wearrior A, signing out. Any one want to buy Street wear Apparel & Accessories? Kush Groove is an online shopping destination for men's and women's street wear apparel, vaporizers, hookah, rolling papers, sneakers, hats and glass bongs.